If you haven’t actually seen toddlers with curly hair, you are in for a good treat! Toddler girls with curly hair simply shine with their radiance, cuteness and you can’t help but want to hug them and see them smile! If you are ever curious about the possible hairstyles for girl toddlers with curly hair, you are on the right page. Here, we have a nice collection of little girl with curly hairstyles below for you! Below, we share with you several curly hairstyles that you can choose for your own cute little toddler. Girl toddlers with curly hair have a lot of potentials – that is if you have chosen a hairstyle that is suitable for your little girl. 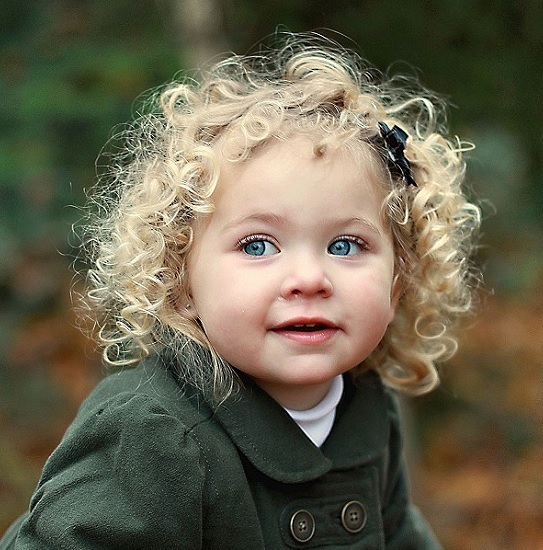 Let’s take a look at the cute curly haircut for toddler girls that we have compiled for you below! Curls that are left unattended will have this stringy appearance, and it could get even more so if you comb through it with a fine comb! Curly hair should be combed loosely for best effects. Nevertheless, if you leave your toddler’s hair to grow as it is, you can expect the hair to curl around her face like this. You can use a hairband to prevent the hair from getting into her eyes. Your toddler girl’s tight curls could be sectioned like this – each a string of their own. In cases like this, you just need to care for the curls with suitable moisturizers and let the curls work wonders on their own! As you can see from the picture above, black girl curls go really well with light-colored accessories. Opt for hair accessories with contrasting colors for best results! Some toddler girl might have loose curls. Theis little girl with curly haircut looks good at any length – even super short ones! The girl in the picture above has a beautiful haircut with loose curls that barely extends below her ears. However, you can see how cute it looks for yourself; Add a little bow, hairband or other accessories to enhance your toddler’s cuteness! 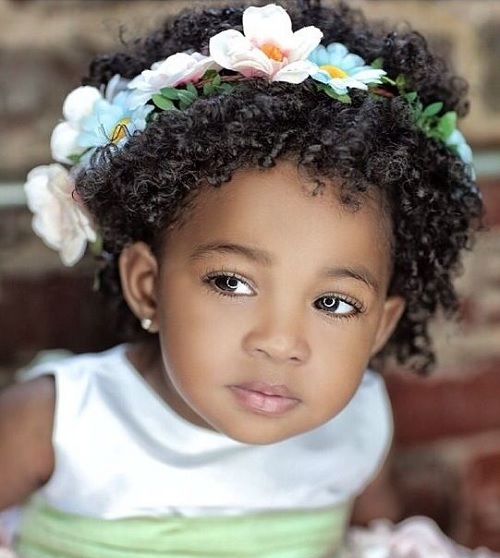 Your toddler’s curly hairstyle could have this texture, especially if her hair is dry and not moisturized enough! However, there are some of us whose hair will always be wild and unmanageable like this no matter how much we take care of it. If your toddler has this hair texture, why not just let it grow out as it pleases? Tight curls are the best type of hairstyle to create this look with ease for a little girl with curly hair. Girl or boy, toddlers with thick, curly hair can get this look almost naturally! All you need is to grow out your toddler’s curls a little and cut off the edges like how you would with a typical bowl cut. Ta-daa! These short tight curls hairstyle for toddlers is complete! Who said baby girls can’t have messy curls? They most definitely can! Toddlers are at the age when they are most playful and active, which is why a haircut that reflects their nature should be welcomed! So, let’s just leave your toddler girl’s curly hairstyle to reflect her carefree self like this. Yes, curly fringes are possible! Just leave the curls at the front a little shorter than other curls at the back. These curly fringes will make your little toddler look like a precious little angel with it loosely dangling in front of her face. Such precious hairstyles for toddlers with curly hair! Here’s another way to manage that curly haircut for your toddler girl. You can use a hair clip to pin her curls to the side. This will keep most of the curls away from her face, while other loose curls would still be free to form themselves as they please. Parents looking for the most natural yet comfortably curly hairstyle for their toddler girls will find this a good option! Organize your toddler girl’s natural curls with tiny butterfly clips around her head. The colors of these butterfly clips may also play a factor in how her hairstyle will turn out! As an example, these clips give off an iridescent glow to the toddler, almost like a halo. Isn’t it a beautiful sight? Just like how us adults have ombre hair dyes, your toddler girl can sport her curly hair just as it is if she is blessed with these wonderful colors! Watch other children stare at her curls in awe without any effort on your part. If anything, all you need to do is to keep her hair length in check so that it doesn’t appear too wild! Well, there you have it! 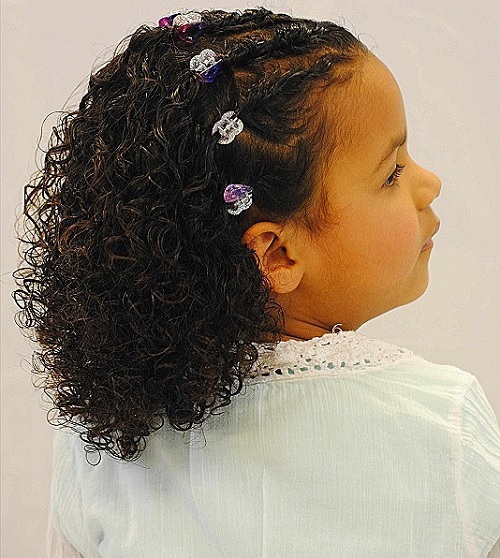 We have shared with styles for toddler girls with curly hair that you might get inspired from. If you have found a nice curly hairstyle that you like, save that picture into your phone! Who knows, perhaps you might need it for when you visit the hairdresser. Let the pictures help you tell the professional about the hairstyle you want for your cute little toddler girl!